We all have our favorite part of the Thanksgiving meal, but we can’t deny that the sweet potato casserole is a both a crowd pleaser and a true classic. Sweet potatoes are one of the most nutrient dense vegetables you can eat; they’re packed with fiber, iron, vitamin A, and vitamin B6, along with high concentrations of many other essential vitamins and minerals. They are also lower on the glycemic index than white potatoes, so you won’t experience a blood sugar spike and crash after eating them. However, the classic spin on the sweet potato casserole often loads up this naturally sweet and nutritious vegetable with extra dairy, fat, and sugar. We believe the flavor of the sweet potato has a lot to offer on its own, so we’ve lightened it up for you, without making it any less delicious. Get ready to bring the star of the show to your Thanksgiving dinner table. This dish also happens to be vegan and can easily be made gluten free, so your friends with dietary restrictions will thank you… but those that don’t won’t even know! 1. First, wash and scrub your sweet potatoes clean. 2. Place your sweet potatoes in a slow cooker, and cook on high for 5–6 hours, or until they are really soft. You should be able to easily pierce them all the way through with a fork. 3. After they are done cooking in your slow cooker, peel the skin off your sweet potatoes. Place all of the soft insides of the sweet potato in a food processor, along with the 1/4 cup brown sugar and 2 tsp cinnamon. You’ll notice there is some juice that in your slow cooker, so pour this into the food processor as well, and blend everything together until your sweet potatoes are thick, creamy and evenly mixed. 4. Scoop your creamed sweet potato out of the food processor, and into the casserole dish, or into ramekins if desired. Spread evenly and set aside. 5. Preheat your oven to 350 degrees F.
6. In a separate dish, whisk together your melted coconut oil, maple syrup, brown sugar, and cinnamon. 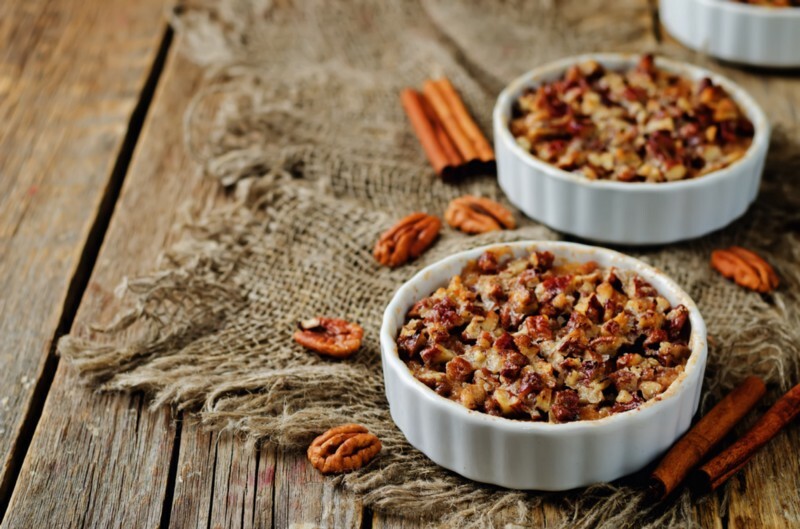 Pour this mixture over the oats, almond flour, and pecans, and stir until evenly combined. 7. Spread your streusel topping evenly over the top of your creamed sweet potatoes. 8. Place your sweet potato casserole in the oven, and bake for 30 minutes, or until the topping is golden brown.